We have given many good tutorials about WhatsApp groups before on How to Chat Online. We recommend you to check our tutorials for using group chats more effectively. 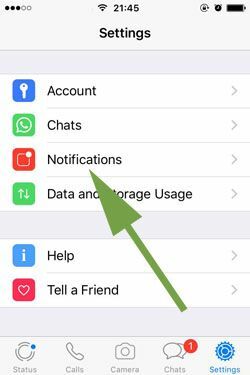 In this page, we will give you information on disabling all WhatsApp group notifications on iPhone and iPad devices. You will able to find all steps for it below and pictures below of each steps. Steps are very easy and you will able to do this in a minute. Let’s tell you how to do that! 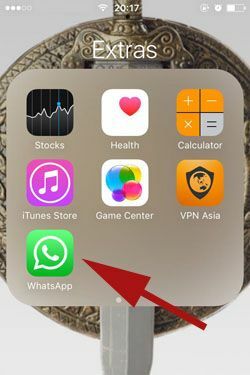 1-) Please run WhatsApp Messenger application on your iOS device first. 2-) Tap on settings button which is located at the menu of the application. You can find it far right side of the menu as we have shown at the image below. 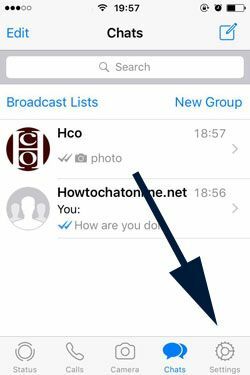 3-) Now you are on the WhatsApp Settings page. You will need to swipe down a little bit to see “Notifications” button. Tap on “Notifications” button. 4-) Please disable “Show Notifications” as same as we have shown in the picture below. It is just under the header of “Group Notifications”. After you disabled the “Show Notifications”. You will no longer get any notifications from any groups of WhatsApp Messenger. However when you disabled this option for groups there will be no exception for you. We recommend you to set group notifications one by one (if there is any important group for you) after you disabled this feature. One of our tutorials on How to Chat Online will also help you to disable notification banners too.